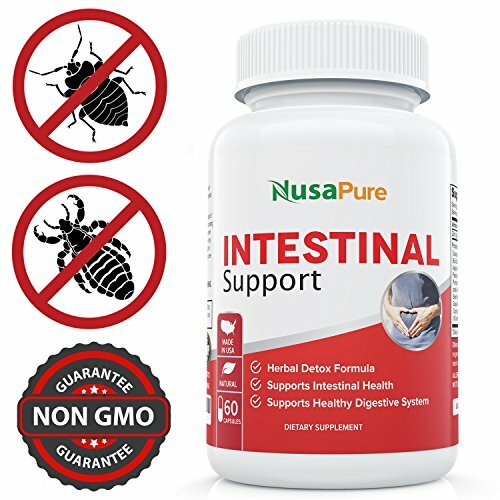 Intestinal Support for Humans (NON-GMO & Gluten free) with Wormwood, Garlic, Black Walnut Hull & More: 60 Capsules - 100% Money Back Guarantee - Order Risk Free! The powerful combination of herbs carefully selected in Max Strength Intestinal Support is formulated by NusaPure master herbalist and is gentle on your body, yet tough on unwelcome guests which may be taking up residence in your intestines and derailing your health efforts. The large intestines (colon) can harbor unwelcome guests that may be sapping your energy and robbing the nutrients from your food. You may have contracted them from traveling overseas, in the schoolyard, unclean hands used to prepare your food, or contaminated food and water. Why is Nusapure Intestinal Support the Top Pick? NON-GMO & GLUTEN FREE - Our "Easy To Swallow" 1485MG formula includes Cranberry Fruit, Garlic Blub Extract, Black Walnut Hull Powder, Apple Pectin Fruit Powder, Carrot Root Powder, Papaya Fruit Powder, Pau D'Arco Bark Powder, Pumpkin Seed Powder, Wood Betony Powder, Butternut Bark Powder, Cloves Seed Powder, Wormwood Powder, Oregon Grape Root Powder, Blueberry Leaf (20% exract), Coptis chinensis Root, Goldenseal Root, Echinacea angustifolia Root Powder, and Zinc. MADE IN THE USA: All NusaPure supplements are made in the USA, in a FDA registered facility adhering to strict GMP (Good Manufacturing Practices). Every batch is quality tested so you know you are only getting the healthiest and purest ingredients Available. MAXIMUM STRENGTH BUT GENTLE ON YOU - This product is meant to be taken for 10 days only. 2 capsules of Intestinal Support must be taken with meals 3 times daily. If you want to try the product again we ask that you wait 2 weeks before doing so. Customers that followed these instructions experienced the most effective results. 100% MONEY BACK GUARANTEE - If for any reason you are not satisfied with this formula you can get a full refund with no questions asked. Our customers MUST be satisfied. If you have any questions about this product by NusaPure, contact us by completing and submitting the form below. If you are looking for a specif part number, please include it with your message.